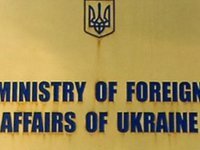 The Ministry of Foreign Affairs of Ukraine expresses its deep concern about the increasing number of provocation acts on the part of Russian security forces against citizens of Ukraine and calls upon the Ukrainian citizens to refrain from trips to Russia. "Taking into account the temporarily limited ability of the Ukrainian side to provide adequate security for our fellow citizens on the territory of the Russian Federation, Ukraine's Ministry of Foreign Affairs calls on the citizens of Ukraine to refrain from trips to the Russian Federation, as well as from traveling through the territory of this state", the statement says posted on the official website of the Ukrainian Foreign Ministry on Wednesday. The Foreign Ministry also said that the Russian Federation has increased the number of unfounded arrests of citizens of Ukraine, and the Russian law enforcement agencies "roughly treat Ukrainians, apply unacceptable methods of physical and psychological harassment and other acts that demean human dignity." At the same time, the detainees denied access to lawyers and consuls. "The Russian side violates the universal norms of international law in the sphere of observance of human rights and freedoms, as well as its international legal obligations under the Vienna Convention on Consular Relations of 1963 and the Consular Convention between Ukraine and the Russian Federation of 1994," the message says.